How can I change my account URL? It is possible to change the sub-domain of your DeployBot account. To change the sub-domain, log in as the Account Owner and click on Account in the top right. From the account page, you will find an option to edit your sub-domain. Click on the Do you want to change this URL? hyperlink. You will then be able to type in your desired new sub-domain. Click on  Update the URL and your sub-domain will be updated. 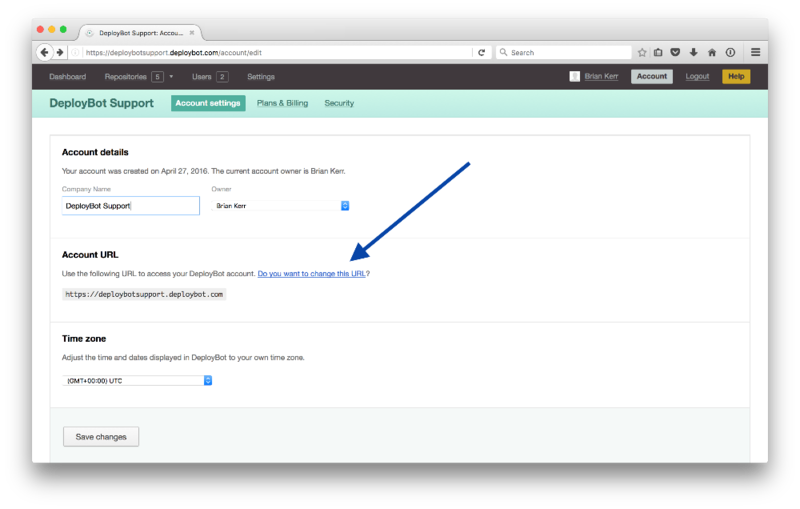 Changing your account URL affects API clients and webhooks that refresh the repositories on our side. The change is immediate. Please make sure to update bookmarks and notify users that need to log into your account to be aware of the change. Please make sure to update the webhooks in your GitHub/Bitbucket account to use the new URL.